We are a unique entity in the market, actively committed towards offering an optimum range of White Topaz Gemstone. 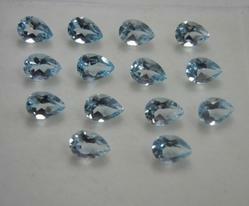 This is Topaz Glass/ Nano/ Hydro.This is made on order at our factory in Jaipur. Manufacturer And Exporter Of Finest High Quality Multi Color Quartz Briolettes In Different Shapes, Different Cuts..
Shapes-Heart, Pear, Onion, Tear Drops, Coin, Cube, Marquise, Oval, Leaf & Custom Shapes In Chekkerboard, Rose Cut & Custom Cuts..
White topaz has become the 2nd most popular colored gemstones after sapphire !! This is not a surprising ! 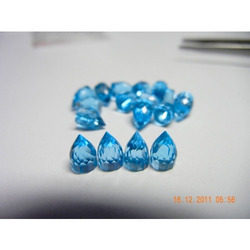 We are engaged in providing a wide range of Topaz Stone for Religious Mystics in different specification to meet the diverse requirement of client. AAA Quality Natural Untreadted Imperial Topaz Beads / Size 7-8mm Rondelle Faceted Beads / Strand 10inches long / Rare Gemstone Beads.